Yet a very small question. Russian mustetiers transform in to modern step by step - with Peter rules event. What happens with Polish - Lithuanian and Hungarian ones - do they go through similiar proces on the way? No, the guys could not identify some specific events for those. So for now they upgrade by training and experience. PhilThib wrote: No, the guys could not identify some specific events for those. So for now they upgrade by training and experience. Well it is hard for me to tell how was it with Hungarian. polish authors state that initial defeats and swedish invasion trigered reforms of the army. In 1706 Hetman Sieniawski ( who was main commander) issued order finnaly banning muskets and requring that every unit should use flintlock with baynets. in a game terms i think that one can create event - When sweden enter Poland and capture Vilnius or Warsaw polish army upgrade is trigered - Player need to pay EP and money and polish inhranty units and dragoons units began slow tranformation. If Sweded do not invade Poland such an event should be possible bit later on. anyway, i would love at some point to see some games that would inwolwing more of internal politics and economy. It would be great to struggle with reforming Poland - Lithuania while navigating it thorugh Great Northern War or to manage spanish admistration or turkish empire and its economy. There were so many interesting European turning points where miliatary/diplomacy and economy were mixing. Thanks for the link Marek. I am very interested to know more about Polish -Lithuanian army in GNW. It is hard to find OOBs or even find pictures that shows how they looked like in that period. Was it any major differences between nationality? Was Polish and Lithuanian troops simular like for example the Swedish and Finnish. There seems to be a good variety of cavalry. I am thinking of, Husaria, Pancerni, Petyhorcy, Jazda, Rajtaria, Dragonia, etc... There was also cavalry of other origin like, Tatarzy, Kozacy and so on. Maybe it could be a good idea for the game to "polish polish" cavalry? As for army tactis/uniforms/structure. Taking in to consideration all the things i stated abowe i will give you few facts. half of them were infrantry. Infrantry units were organizes in to small regiments, ( around 400/700 ) soldiers. these units were funtining as battalions on the battlefield. Such an organistion was intrudced by king Sobieski around 1670. Polish infrantry was always using relaitvly small number of pikes as it never really needed protction against cavalery. Pikeman were 10/20 percent of every unit. Musketers were using long double axes instead of a forket. Uniforms were blue. Regiments were mostly named after their commander ( just like in wester europe). Best units had their orginal name. Rest of cavalary was recruited using so called "commarads recriutmed" - meaning that a member of gentry was issued a letter to recruit number of people and was organised in small units of 200 people being combined in to regimnts "pulk" named after their commanders. main cavalery force was "pancerni" - meaning iron/metal ones. It was medium heavy cavalery, using small protection plates and short pike. sometimes rifle/muscet. and sabre ofcourse. and more over there were cossack units - combinin both of light infrantry and light cavalery. And there were tattar units - as there was huge number of tatars who were settled in Poland-Lithuania. anyway as i wrote it is jus small part of fascinating history. Polish-Lithuanian army was higly effective strong miliatry force for most part of its history. It fought nyumber of different enemies - very ofthe in the same time - Swedes, Austrians, Russians, Turks. It achivied fantastic victories in its historyy - capturing Moscow 2 times, giving a tought time to Gustaw Adolf in 1626-1628 or destroing turkish army under Vienna. Yet in GNW it was just a shadow of its former glory - mostly because of the crisis of the country. In opertion sense - it was organises as two main armies - Armia Koronna, and Armia Litewska. They funtio as sepparete entities - as the country was federatiopn. Ussualy Armia Koronna was twice as big as Armia Litewska. as for pictures - i have some books in my country house, will look for them. Liberty Bell wrote: Thanks for the link Marek. There was also cavalry of other origin like, Tatarzy, Kozacy and so on. Maybe it could be a good for the game to "polish polish" cavalry? Marek, you gave an excellent summary and overview. You should put it at Wikipedia as this information is so hard to find. I now see that the new patch has "polish polish" army according to what you told. That makes me happy, as what I love with this games, is that it try to be historically correct. You can learn something and be interested to learn more. especially about the political and military situation at the GNW. Very good suggestions, Marek. Just several remarks. According to Tomasz Cieselski and some others authors the process of matchlock replacement with flintlock musket took much longer time. Realistically from 1703 and finished only in 1728. Most of the new flintlock firearms were Prussian models of 1701-1713, some Saxon and partly Swedish ones of 1699 (trophies mostly purchased from Russia). In game terms I think it would be better if only part of infantry troops would be represented as "modernised' later in game. I agree. Pancerni (also called Petyhoria for Lithuanian army) as chain mailed medium cavalry type, Ulhans and Vlachs as light cavalry, Lipka Tatar and Cossack units are missing and should be introduced really. I have a hope that they would be added to the Polish OOB properly. More like loosy confederation with two governments and armies. Actually the Crown (Polish) Army sometimes was three-four times bigger than Lithuanian. Mostly due to demographic differences of two parts of PLC. This happened only in 1720s. 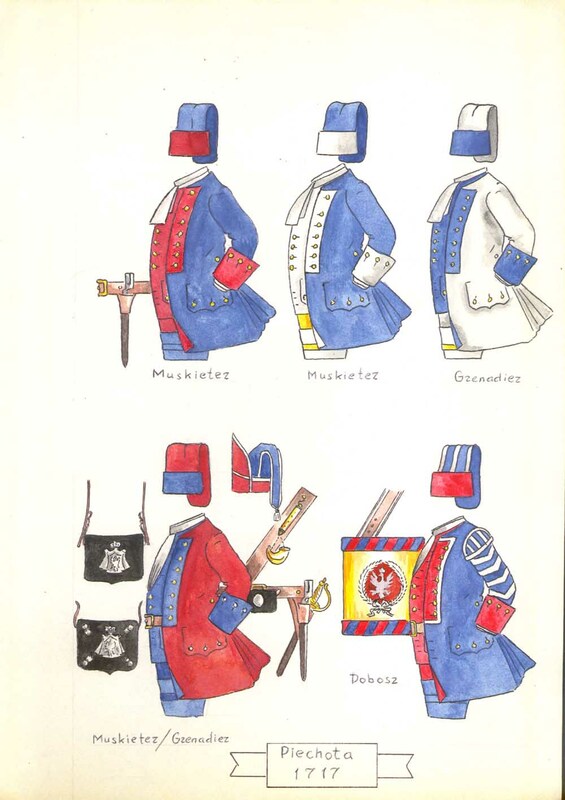 As the result of 1717 reform they first received European style uniform but with funny hats.